That headline is not from a vintage circus poster—it describes a species of fish at the California Academy of Sciences' unprecedented aquarium exhibit, Twilight Zone: Deep Reefs Revealed, which opened today. Hundreds of feet below the ocean surface, mysterious coral reefs sit in the so-called twilight zone, one of the least explored places on Earth. At 200 to 500 feet deep, the corals are so difficult for humans to reach that few of us have ever, or will ever, see it for ourselves. 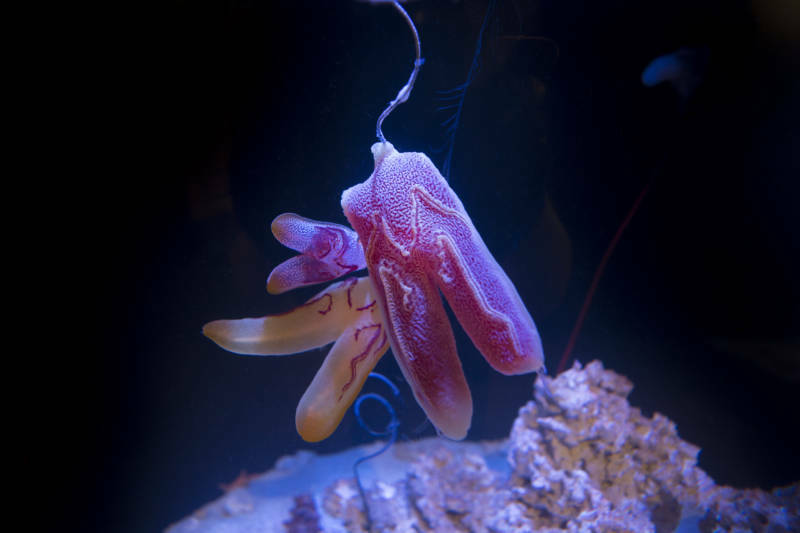 Thanks to new diving technology, Academy scientists have brought the twilight zone up from the deep to Golden Gate Park. The exhibit is rich with species on display for the first time ever. Sacura speciosa is so new, in fact, it lacks a common name. Academy scientists call it the Mind-Blowing Super-Freaky Rainbow Fish because it blew their minds when they first saw it. Twilight zone species have adapted to live in near darkness. But that doesn't mean they camouflage in muted grays and blacks. 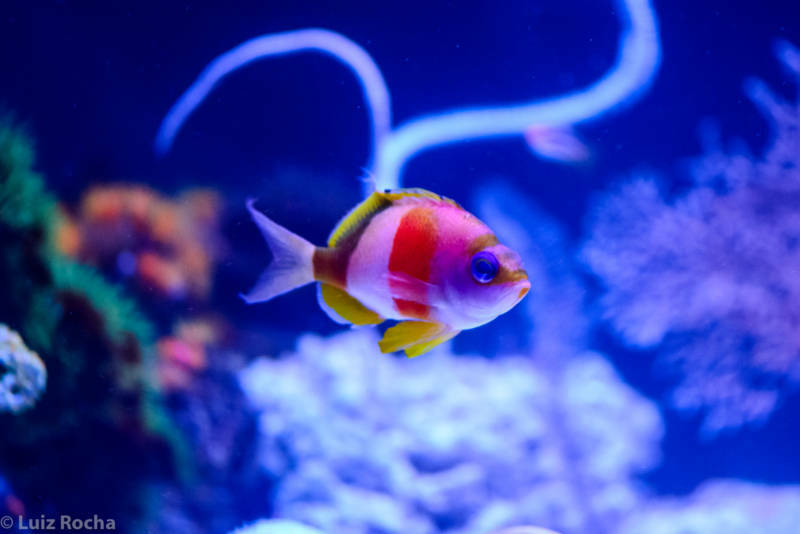 Most fish, actually, have bright red, yellow and orange markings. Water acts like a color filter, he explains. Sunlight hits the surface in its full rainbow glory, but as you go deeper, the colors begin to disappear—reds go first, blues go last. So at 200 feet, red is invisible. It's the ultimate camouflage to hide from predators and sneak up to prey. Twilight corals have evolved their own low-light tricks. Unlike their shallower relatives that make food from sunlight, these corals mostly grab plankton from the water. They also use fluorescent pigments to reflect light, ping-ponging it from place to place to brighten up the otherwise dark reef. 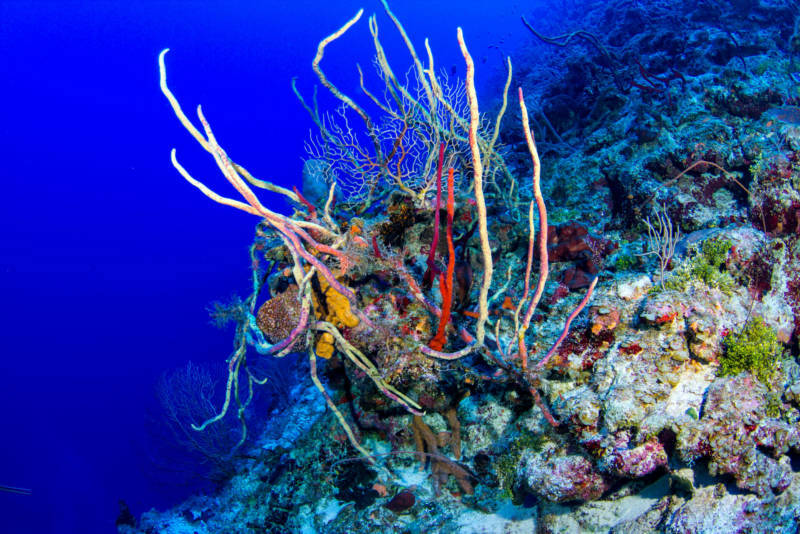 While many shallow corals are devastated by ocean acidification, the twilight zone seems unaffected, Rocha says, likely because of the cooler water temperatures. But the corals can’t escape another human-caused threat—plastic. 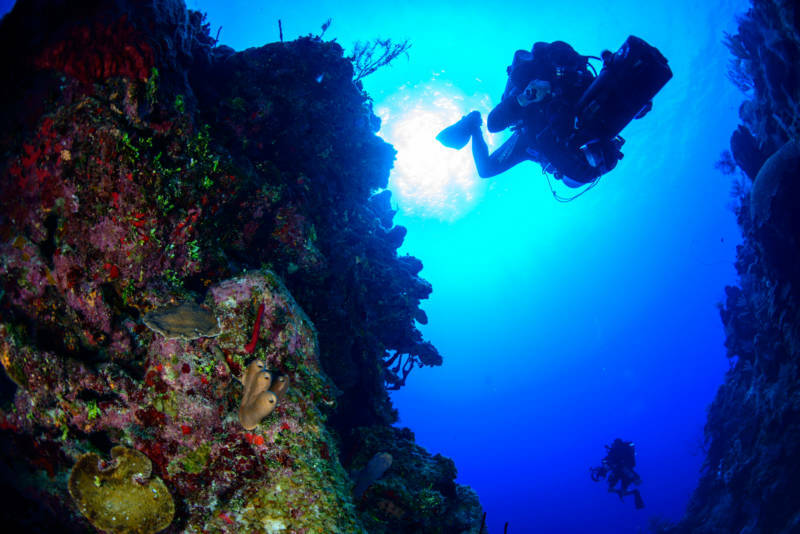 Rocha and his team have been the first humans to explore many twilight coral reefs and 10 out of 10 times there were fishing lines and plastic already there. “One dive in the Philippines, we saw a toilet seat on the reef. Reefs that nobody has ever seen before are covered in human waste and trash,” says Rocha. Normal scuba tanks contain nitrogen and oxygen, but at twilight zone depths breathing nitrogen feels like drinking two bottles of wine. That's not a condition the divers can be in when they're making critical decisions affecting their survival. So the divers used oxygen mixed with non-intoxicating helium, an outrageously expensive gas. A new technology called "re-breathing" recycles exhaled helium so divers can breathe a little more affordably. The fish, on the other hand, had to survive a journey up to sea level. Since their bodies are adapted to ocean pressure at 400 feet down, Academy scientists developed pressurized containers for collecting specimens. The fish arrived at the surface under the same pressure they're used to below. Then, slowly, over several days, scientists released the pressure from the deep. Now acclimated to sea-level, fish like our Super Freaky friend swim safely in the exhibit aquariums.